We are the leading Manufacture & exporters Made from superior quality raw material our range of polyurethane foam for home furnishings (PU) are in sync with the current demands of the industry. We are pioneers in the PU foam industry. Our Sleepwell range of Home Comfort Products includes Mattresses (P.U. Foam, Spring, Latex Plus, Rubberised Coir), Pillows (P.U. Foam, Memory Foam & Polyester Fibre) & Cushions (P.U. Foam) for seating application. We are the leading Manufacturer & exporters put forth a huge array of Comfortable Products (Mattresses,Pillow,Cushion etc) each uniquely designed for specific requirements and tender assorted sense of comfort and competence. The choices we offer includes flex-puf, flex coir, latex plus, durafirm back support, spring and hospital mattresses ,Healthcare Industry Mattress, Foam Mattresses, Coir Mattresses and many more. Sleep-well flexi-puf mattresses are available in a wide combination of comfort and support, catering everyone. These mattresses are designed to ensure that the users wake up refreshed every day. They are light, durable and are available with a guarantee of up to 25 years. Our range of mattresses is for those who needs an additional support. It provides the ultimate sleeping experience, making it a masterpiece that’s a perfect match for the luxurious lifestyle of our revered clients. 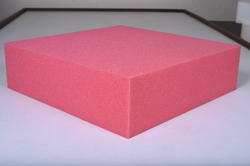 Major Application of Foam for Comfort Products. Impressions : Pillow users Visco Elastic Temperature Sensitive Material developed by NASA, which reduces the pressures on the head, resulting in a comfortable and tranquil sleep. It has a primary cover of a special fabric called 'Lycra', the uniqueness of Visco Elastic Temperature Sensitive Material makes this pillow the first choice for health conscious people. Prima: Made up of 23 Density soft flexible Polyurethane material for better support & comfort. 100% cotton primary cover which makes Flexi-Puf Pillow ideal for all seasons. These are available in Medium, Large and Extra Large size. Anubhav : A refined model of Fibre category made up of 100% Hollow Siliconised Fibre for extra softness and better feel. A primary cover of 100% cotton fabric keeps it fresh and comfortable round the year. These are available in three sizes: Medium, Large and Extra Large. Ahsaas :Made up of Texturised Fibre which provides comfort with a soft & soothing feel. With a primary cover with enhances the product life. These are available in three sizes: Medium, Large and Extra Large. We are the leading Manufacture & exporters users can add that extra touch of comfort and style to their expensive furniture with our range of furniture cushions. These cushions are made of 100% foam. This ascertains that they won’t sag and the furniture will look new for a prolonged period of time. Apart from that it also retains its shape easily. Sleep-well furniture cushioning range consists of seat cushions, furniture sheets and soft-line furniture sheets and many more. Seat Cushions are used to provide cushioning in furniture seats. The right selection enhances life of the furniture and especially the fabric used. Available in 50, 40, 32, 28 and 23 densities and several sizes. Categories in which seat cushions are available– Latex Plus, Flexi Puf. These Flexi Puf Sheets are used for cushioning the back and arm rests of your furniture. They are easy to fabricate and can be cut to any size or shape. These complement the Seat Cushions in your furniture. Available in 50, 40, 32, 28 and 23 densities and several sizes.